Mr R visited Sussex Trichology when he was suffering from eczema on his scalp. It was inflamed and had many itchy spots. The most common type of scalp eczema is known as seborrheic dermatitis. After a regular treatment, Mr R is happy with scalp and kind enough to leave a testimonial for us. I came to see Shuna following a recent spell in hospital in which I was unable to wash my hair for several weeks. I consulted Shuna as regular washing was not helping the scale on my head which felt sore and itchy with crusted lumps of skin. 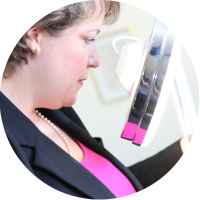 On arrival at Sussex Trichology Shuna examined my scalp and diagnosed an eczema condition. She then went on to apply various creams, place me under a steamer and washed my hair. As you can see from the pictures on the left, the results are impressive. My scalp no longer feels tight and sore, and I am able to maintain the condition at home using a Sussex Trichology prescription shampoo. Thank you so much, Shuna!